Legumes are a very special type of crop; they are not only a source of highly nutritious food and feed but legumes require no inorganic nitrogen fertiliser, which means they have major advantages as a more sustainable crop. Despite their benefits, legume-based farming systems have not become common practice as they are seen as being less profitable. This may soon change however, owing to a new research initiative led by scientists at the James Hutton Institute, working with colleagues from European organisations. 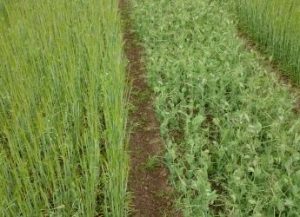 The “TRansition paths to sUstainable legume-based systems in Europe” (TRUE) research project aims to identify how society may transition to sustainable legume-based farming systems and agricultural feed and food networks. Funded by the European Union’s Horizon 2020 research and innovation programme, the €5m TRUE project involves 24 partners comprising research, industry, education and social organisations with interests in legumes that span the supply chain. Over a four-year period, this transdisciplinary team will bring together and resolve knowledge of legume production, processing, economics, nutrition and environmental impacts to see how best legume supported systems become the norm. Dr Pietro Iannetta, an agroecologist from the James Hutton Institute’s Ecological Sciences group and coordinator of TRUE, said the potential of legume-supported food production is immense. “Under current consumption patterns Europe imports 70% of its protein. There is also an increasing demand for plant protein which can help tackle poor diets and health problems. Dr Iannetta added that there is growing preference for healthy, sustainably-grown food, both by consumers and shops. “More obvious items on the shelves include grain legume-based breads and crisps. Less obvious legume based products are sustainable proteins in the form of meats from aquaculture-based fish and shellfish farms, and legume-grass fed cattle and now even beer. However, to maximise the benefits the level of interest needs to be encouraged in a manner which ensures home-grown legumes are exploited. The research will lead to recommendations on how to empower the production of novel legume-based products, on the basis of improved market awareness, understanding and capabilities. As the project focuses on innovation, a number of practical outcomes across the supply chain are envisaged, from the fabrication of new precision agriculture equipment to food technologies for improved formulations of food and animal feeds, especially aquaculture. The project will also advise on policy amendments that would stimulate the uptake of new farming, processing, manufacturing and retailing practices. The project website is www.true-project.eu, and project updates can also be found on Facebook and Twitter.